Obama Team Focuses On Romney, Pawlenty Or Huntsman As Likely Foes : It's All Politics It will be months before Republican voters actually choose their party's presidential nominee. But Obama's re-election team can't wait that long; they've already winnowed the Republican field down to the three GOP candidates they most fear. 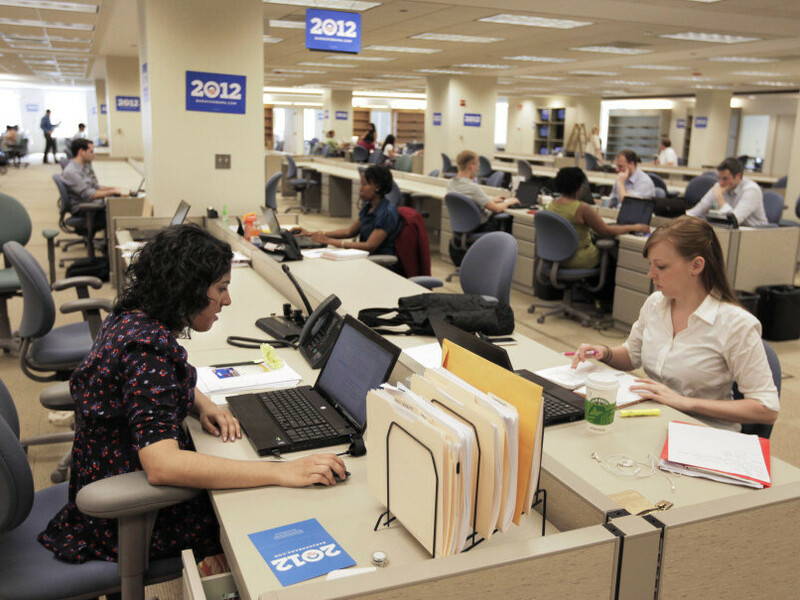 President Obama's 2012 re-election campaign headquarters, May 12, 2011. It may be months before Republican voters actually get the chance to determine who their nominee will be. Only three Republican candidates for president are listed on the wall of President Obama's new campaign headquarters — Mitt Romney, Tim Pawlenty and Jon Huntsman. An aide said the Obama campaign and DNC are keeping tabs on more candidates, but the list gives a pretty good sense of whom Obama's team thinks its candidate might face this fall. Pawlenty seems less likely after his lackluster performance at Monday evening's GOP presidential debate in New Hampshire. A separate point: If anyone should be disappointed by how that debate turned out, it should be Obama and his re-election team. They have to be hoping for a knock-down, drag-out Republican primary fight which results in a tattered nominee to face a president whose party appears united behind him. That didn't happen at Monday night's debate which turned out to be a mutually respectful affair. Which, again, is bad news for Obama's re-election team.